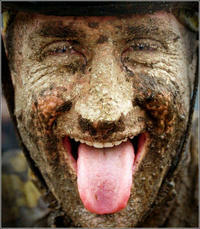 Forum » News / Front-page » Alex Brown has mud in the eyes? A while ago, I was riding my mountain bike under the deluge, with plenty of mud in the eyes, I was unable to ride correctly, it was dangerous. Now it seems that Alex Brown has also some mud in the eyes. The International Organization for Standardization (ISO) requested at the beginning of October that ODF maintenance work be aligned between Oasis and ISO, in a move that Groklaw's Pamela Jones described as "a takeover attempt of ODF". Groklaw alleged that ISO's SC34 committee, which oversees the development of Microsoft's rival OOXML format, was "tilted by Microsoft employees". SC34 would be in charge of ISO's ODF work. However, Alex Brown, the convener of SC34, told ZDNet Asia sister site ZDNet UK at the time that Jones's post was "chock-full of misinformation and spin". ISO/IEC standards have to be managed and published by ISO/IEC committees even if they are created elsewhere, Brown said. Dear Mr Brown, who paid the dinner in Korea? How many Microsoft employees were around the table? Re: Alex Brown has mud in the eyes? Who is slinging mud here?